A critical aspect of kidney function occurs at the glomerulus, the capillary network that filters the blood. The glomerular basement membrane (GBM) is a key component of filtration, yet our understanding of GBM interactions with mesangial cells, specialized pericytes that provide structural stability to glomeruli, is limited. We investigated the role of nephronectin (Npnt), a GBM component and known ligand of α8β1 integrin. 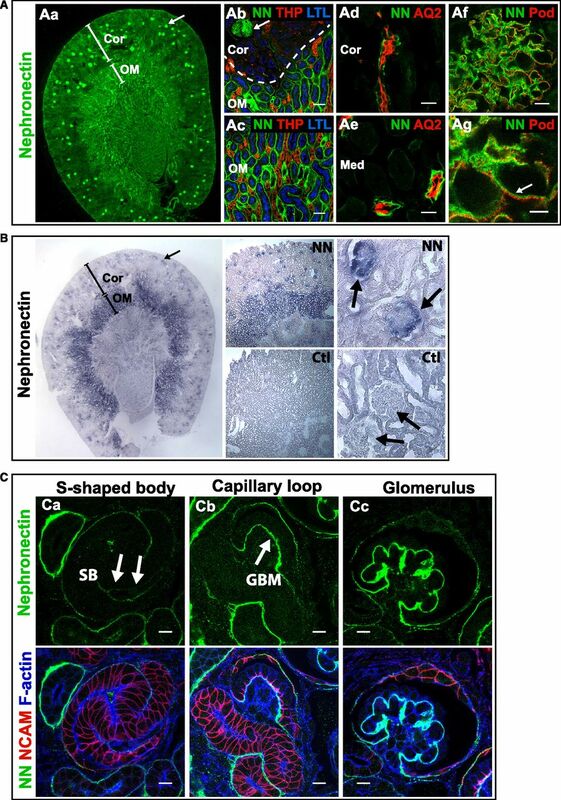 Immunolocalization and in situ hybridization studies in kidneys of adult mice revealed that nephronectin is produced by podocytes and deposited into the GBM. Conditional deletion of Npnt from nephron progenitors caused a pronounced increase in mesangial cell number and mesangial sclerosis. Nephronectin colocalized with α8β1 integrin to novel, specialized adhesion structures that occurred at sites of mesangial cell protrusion at the base of the capillary loops. Absence of nephronectin disrupted these adhesion structures, leading to mislocalization of α8β1. Podocyte-specific deletion of Npnt also led to mesangial sclerosis in mice. These results demonstrate a novel role for nephronectin and α8β1 integrin in a newly described adhesion complex and begin to uncover the molecular interactions between the GBM and mesangial cells, which govern mesangial cell behavior and may have a role in pathologic states. Nephronectin, a basal lamina protein with five EGF-like motifs, an RGD sequence, and a COOH-terminal MAM domain,12 is a constituent of the GBM.11 Nephronectin also is produced by the ureteric epithelia and has an essential role in early kidney development.13,14 In this context, it represents the major ligand for α8β1 integrin,12,15 which is produced by the adjacent metanephric mesenchyme. Mice null for Npnt, the gene encoding nephronectin, have renal agenesis with high penetrance,13 as do mice and humans lacking Itgα8, which encodes the α8 subunit.16,17 Together, the data suggest that an interaction between nephronectin and α8β1 integrin is required for adhesion and/or signaling between the ureteric epithelia and metanephric mesenchyme to initiate kidney development. In this study, we find that nephronectin is expressed by podocytes and localizes to the GBM in glomeruli. The α8β1 integrin is specifically produced by adjacent mesangial cells, where it is noticeably enriched at lateral protrusions of mesangial cells that appear to anchor capillary loops. Nephronectin colocalizes with α8β1 integrin at this location. Previously, the renal agenesis phenotype of Npnt null mice precluded study of nephronectin’s function in other aspects of kidney structure and function. 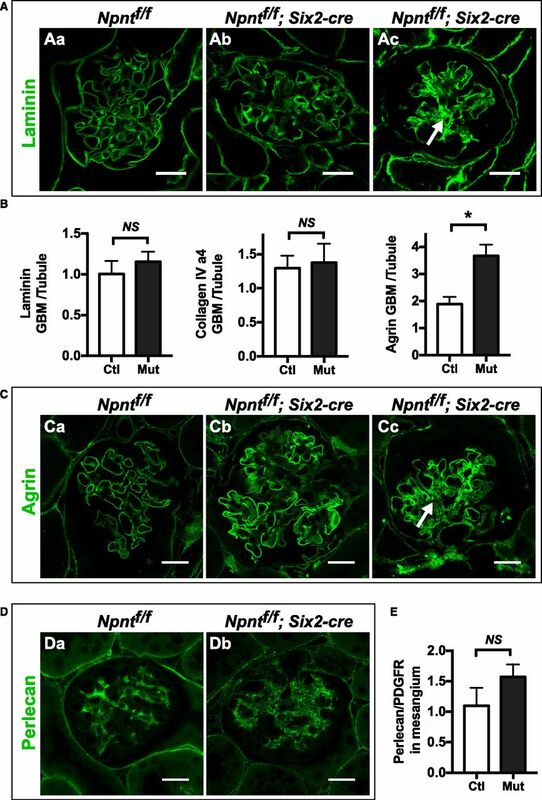 To overcome this limitation, we developed mice with conditional Npnt deletion in nephron epithelial progenitors and their derivatives using the Six2-cre. These mice developed structural defects in glomeruli, most prominently an increase in mesangial cell number and matrix, with a loss of the lateral mesangial cell adhesions. Mice with deletion of Npnt specifically from podocytes using the Podocin-cre had similar structural defects, indicating the phenotype is due to loss of nephronectin from the GBM. Taken together, our data suggest a model in which GBM–mesangial cell interactions, specifically via nephronectin and α8β1, form an essential adhesion that modulates glomerular structure. Immunolocalization of nephronectin in adult mouse kidney showed it localizes to glomeruli (Figure 1, Aa and Ab) and a subset of renal tubules. Using markers of different tubule segments, we found it localized to the basal lamina of the S3-segment of proximal tubules (Figure 1, Ab and Ac) and of the collecting ducts (Figure 1, Ad and Ae). It was not present in thick ascending limb tubules (Figure 1, Ab and Ac). In mature glomeruli, it was found largely at the GBM with low levels in the mesangial matrix (Figure 1, Af and Ag). Because nephronectin is a secreted protein, we performed in situ hybridization for Npnt RNA to determine which cells express nephronectin within glomeruli (Figure 1B). There was a strong signal at the outer rim of glomerular tufts (indicated by arrows), suggesting nephronectin is predominantly synthesized by podocytes. Additionally, we examined nephronectin localization during glomerular development (Figure 1C). Low levels were found in the basal lamina of the s-shaped body and capillary loop stages (arrows), with higher levels in the GBM of maturing glomeruli. These results suggest podocytes synthesize nephronectin and deposit it into the GBM. Nephronectin localizes to glomeruli and renal tubules in mice. (A) Immunolocalization of Npnt in a coronal section of an adult mouse kidney. (Aa) Npnt (NN, green) localizes to glomeruli (arrow) and tubules. The cortex (Cor) and outer medulla (OM) are depicted. At the (Ab) corticomedullary junction and (Ac) outer medulla, Npnt localizes to glomeruli (arrow in Ab), and the basal lamina of proximal tubules marked by apical Lotus Tetragonolubus Lectin (LTL, blue), in the OM but not cortex, indicating it localizes to the S3-segment of proximal tubules. Thick ascending limb tubules are identified by Tamm Horsfall Protein (THP, red). (Ad and Ae) Npnt also localizes to tubules in the (Ad) cortex and (Ae) medulla (Med) that contain Aquaporin 2 (AQ2, red), a marker of collecting ducts. Nephronectin localizes to the GBM in glomeruli (Af and Ag, arrow) adjacent to podocyte foot processes that are marked by podocin (Pod, red). (B) RNA in situ hybridization for Npnt (purple) and control (Ctl, sense probe) in adult kidney shows high expression in glomeruli (arrows) and tubules of the OM, which are likely S3 proximal tubules identified in (A). Staining of glomerular tufts is limited to the outer rims where podocytes reside. (C) Immunolocalization of Npnt in a P0 kidney. (Ca) Low levels of Npnt are found in the primitive nephron tubule, the s-shaped body (SB), including the vascular cleft where the glomerular tuft will develop (arrows). At (Cb) the capillary loop stage and (Cc) in maturing glomeruli, Npnt localizes to the developing GBM. Merge images show NCAM (red), a marker of the developing nephron epithelia, and F-actin (blue) to aid in identification of structures. Scale bars: 50 μm in (Ab and Ac); 20 μm in (Ad and Ae); 10 μm in (Af and C); 5 μm in (Ag). Ctl, control; LTL, Lotus Tetragonolubus Lectin. Because of the renal agenesis that occurs in Npnt null mice due to its important role in the ureteric epithelia, we generated mice with conditional deletion of Npnt using the Six2-cre line. This line induces deletion of Npnt within nephron epithelial progenitors and their derivatives (including podocytes), but not the ureteric epithelia. We also generated conditional deletion of Npnt using Pax3-cre18 and Wnt4-cre19; however, both lines gave mutant pups with renal agenesis, and thus were not suitable for our purposes. Our histologic characterization of the Npnt mutant mice (Npnt fl/fl; Six2-cre) showed that all had a prominent expansion of the mesangial area, an example of which is shown in Figure 2A. Conditionally heterozygous mice (Npnt fl/+; Six2-cre) also had mesangial expansion, albeit milder than mutants. The phenotype in Npnt fl/+; Six2-cre mice is consistent with a prior study showing that reduced nephronectin in Npnt+/− mice causes renal agenesis that is less severe/penetrant than in Npnt−/− mice,13 suggesting full gene dosage of nephronectin is functionally required within the kidney. However, to determine if the mesangial expansion was due to the Six2-cre allele, rather than loss of nephronectin, we performed double-blinded, semiquantitative analysis of the mesangial expansion in mice at 6 weeks of age (Figure 2D). 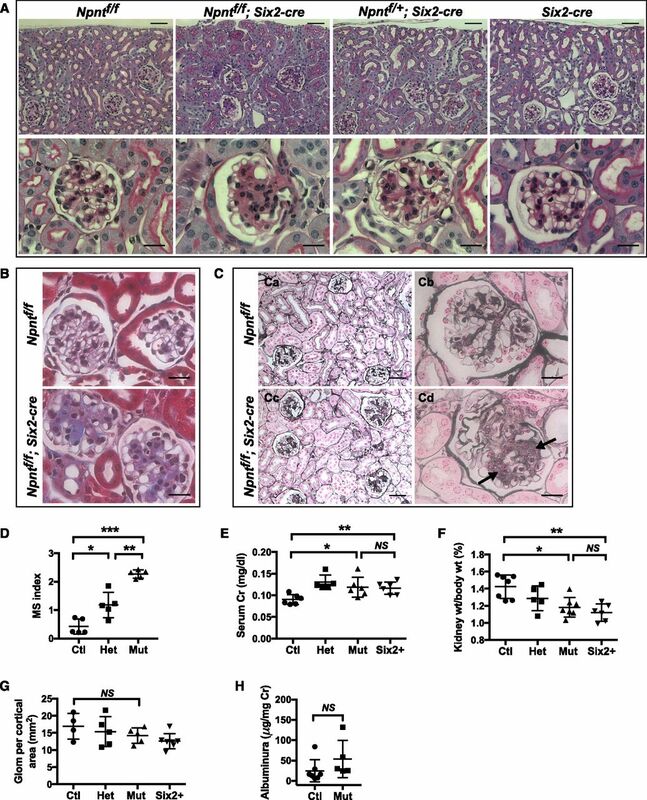 This revealed that Npnt fl/fl; Six2-cre mutant mice had more severe mesangial expansion than Npnt fl/+; Six2-cre mice, demonstrating that loss of nephronectin contributes to mesangial expansion. Similar results were obtained in mice at 4 months of age (not shown). Absence of nephronectin leads to mesangial expansion. (A) Periodic acid–Schiff–stained kidney sections of 6-week-old mice. A prominent expansion of the mesangium is noted in mutant (Npntf/f; Six2-cre) and heterozygous (Npntf/+; Six2-cre) mice. (B) Masson’s trichrome stain from 6-week-old mice. (C) Jones’ methenamine silver stain from sections of 4-month-old mice. (Cd) Areas of matrix deposition in Npntf/f; Six2-cre mutants are indicated by arrows. (D) Mesangial sclerosis (MS) index in 6-week-old mice. See Concise Methods for details (*P<0.01, **P<0.001, ***P<0.001). (E) Measurements of serum Creatinine (Cr) performed by HPLC in mice at 6 weeks of age (*P<0.03, **P<0.04). (F) Kidney weight shown as a percentage of total body weight at 6 weeks (*P<0.004, **P<0.001). (G) Quantification of glomerular number (Glom) from kidney sections at 6 weeks (P>0.21). (H) Quantification of urinary albumin by ELISA at 6 weeks of age (P>0.19). In (D–F), data were analyzed with a one-way ANOVA and Sidak’s multiple comparisons test was used to adjust P values for multiple comparisons. Scale bars: 50 μm in (A) upper panels, (Ca and Cb); 20 μm in (A) lower panels, (B), (Cb), and (Cd). Ctl, control, (Npntf/f); Het, heterozygous (Npntf/+; Six2-cre); Mut, mutant (Npntf/f; Six2-cre). To determine if the mesangial phenotype of mutants was accompanied by increased mesangial matrix, we examined sections with Masson’s trichrome (Figure 2B). Mutant (Npnt fl/fl; Six2-cre) kidneys had considerable accumulation of blue trichrome stain within the central regions of glomerular tufts compared with controls, consistent with increased collagen deposition in mesangial areas. Sections stained with Jones’ methenamine silver stain (Figure 2C) also showed mesangial expansion in mutant sections, with some glomeruli showing clear evidence of matrix deposition (See Figure 2Cd, arrows). The severe histologic changes in mutants at 6 weeks of age were accompanied by only minor changes in serum creatinine, a proxy of glomerular filtration, and kidney weight (Figure 2, E and F). Additionally, because the minor changes in creatinine and kidney weight were also observed in mice with a single Six2-cre allele alone, they could not be ascribed to loss of nephronectin. The reason for the slight change in these variables in Six2-cre mice is not known. There was no statistical change between controls and mutants in the number of glomeruli per cortical area (Figure 2G) or in urinary albumin (Figure 2H), the latter suggesting the filtration barrier was largely intact. Because of the increased Masson’s trichrome staining in the mesangium of Npnt mutants, we subsequently examined glomeruli for specific matrix components both in the GBM and mesangial areas. Laminin levels were not appreciably changed specifically in the GBM of Npnt mutants compared with controls, as assessed by immunofluorescent staining (Figure 3, A and B). However, in the mesangial area of mutants, laminin was overtly increased, especially in severely affected glomeruli (Figure 3Ac, compare with Figure 3Aa). Examination of collagen type IV (α4 chain), which is a collagen chain restricted to the GBM, was unaltered in mutants. In contrast, agrin, a heparin sulfate proteoglycan (HSP) of the GBM, was significantly increased within the GBM of mutants (Figure 3, B and C). Mutants also showed ectopic agrin deposition in the mesangial area of severely affected glomeruli (Figure 3Cc). Absence of Npnt increases mesangial matrix deposition, especially in severely affected glomeruli. (A) Immunofluorescence with laminin in 4-month-old control (Ctl; Npntf/f, Aa) and mutant (Mut; Npntf/f; Six2-cre, Ab and Ac) mice. A severely affected glomerulus is shown in (Ac), which has increased laminin in the mesangial area (arrow). (B) Quantification of laminin, collagen IV (α4), and agrin in the GBM. Peak fluorescence intensity was obtained along lines drawn perpendicularly through the GBM at capillary loops in the rim of the glomerular tuft. These values were normalized to average fluorescence intensity from similar lines through the basal lamina of adjacent control tubules in the same image. Agrin is increased in the GBM of mutant mice (*P=0.003). n=3 mice of each genotype. Analysis with the unpaired t test. (C) Immunofluorescence of agrin, quantified in (3B). (Cc) A severely affected glomerulus has increased agrin in the mesangial area (arrow). (D) Immunofluorescence of perlecan in (Da) control and (Db) mutant mice. (E) Quantification of perlecan in the mesangial matrix. To attempt to normalize for differences in mesangial area, perlecan signal was normalized to PDGFRβ signal within the glomerular tuft using ImageJ (P=0.09). n=3 mice of each genotype. Analysis with the unpaired t test. Scale: 20 μm in (A, C, and D). Because agrin is an HSP and nephronectin has been shown to bind HSPs via its MAM domain,20 we also examined perlecan, an HSP that mainly localizes to the mesangial matrix.21 The intensity of perlecan immunofluorescence appeared similar by visual inspection (Figure 3, Da and Db). Because we were not able to directly measure mesangial area, we attempted to quantify this by normalizing the total perlecan fluorescence within each tuft to that of another mesangial protein, PDGFRβ, which we assumed was unaltered in the absence of nephronectin. There was no significant difference in the ratio of perlecan to PDGFRβ between controls and mutants (Figure 3E). To summarize these data, mutants had increased agrin in the GBM and increased laminin and agrin in the mesangial matrix. To determine if the increased mesangial matrix deposition was associated with differences in the cellular composition of glomeruli in Npnt mutants, we quantified the percentage of cell types within glomerular tufts. We found the percentage of ERG-positive endothelial cells was not significantly changed between controls and mutants (Figure 4, A and D), but the percentage of WT1-positive podocytes was reduced in mutants (26% versus 33%) (Figure 4, B and E). The percentage of α8-positive mesangial cells was increased in mutants (45% versus 34%) (Figure 4, C and F), consistent with an increase in mesangial cell number. Absence of Npnt increases mesangial cell number. (A and B) Immunohistochemistry with (A) endothelial marker ERG and (B) podocyte marker WT1 from sections of 6-week-old control (Ctl; Npntf/f) and mutant (Mut; Npntf/f; Six2-cre) mice. Scale bars: 25 μm. (C) Immunofluorescence with mesangial marker α8 integrin, endothelial marker ERG, and nuclear marker DAPI in 6-week-old mice. (D and E) Quantification of (A and B) as the percentage of endothelial cells (ERG+) and podocytes (WT1+) per total glomerular cells is shown; >5000 cells were counted from n=3 mice of each genotype. Analysis with the unpaired t test (*P<0.01 in E). (F) Quantification of the immunofluorescence shown in (C) as the percentage of mesangial cells (α8+, ERG−) per total glomerular cells. Analysis with the unpaired t test (*P<0.03). Scale: 25 μm in (A and B); 10 μm in (C). We next examined nephronectin and α8 integrin colocalization within glomeruli (Figure 5A). High-magnification confocal images show that nephronectin and α8 integrin colocalized mainly at the lateral aspects of tongue-like protrusions of mesangial cells that are in contact with the GBM at the base of the capillary loops. We will refer to these protrusions as “mesangial pedestals.” Images of mesangial pedestals visualized at their midpoints (Figure 5, Ba–Bf, arrows) show that α8 integrin is greatly enriched at the lateral/outer aspects. This site is where mesangial cell processes insert into the GBM, precisely at the location where the pericapillary GBM transfers into the paramesangial GBM.10 Importantly, other areas of GBM-mesangial contact that are not at the base of the capillary loop (and not at the pedestals) have lower levels/smaller clusters of α8 integrin (Figure 5, Ba and Bd, arrowheads). These data reveal the presence of a unique, α8 integrin–based, GBM-mesangial adhesion that exists at the base of the capillary loops. Npnt localizes with α8 integrin and is required for the formation of unique GBM-mesangial adhesions. (A) Immunofluorescent imaging of α8 and Npnt in an adult mouse glomerulus shows that α8 in mesangial cells and Npnt at the GBM colocalize (arrows) at the lateral aspects of mesangial, tongue-like protrusions contacting the capillary loops (CL). (B) High-magnification images of control (Npntf/f) glomeruli show the lateral enrichment of α8 (Ba and Bd, asterisks) at mesangial protrusions (arrows), which appear to tether the base of capillary loops (CL). Other portions of the mesangial cell (Ba and Bd, arrowheads) have lower α8. CD31 and nephrin indicate the capillary loop and podocytes. (C) High-magnification images of the same structure in mutant (Npntf/f; Six2-cre) glomeruli show little focal α8 enrichment and the absence of mesangial, tongue-like protrusions (Ca and Cd, arrows) at capillary loops (CL). The α8 integrin is more diffuse (arrowheads). (D) Immunoprecipitation (IP) of anti-nephronectin from neonatal kidney lysates. Lanes: (1) Soluble lysate (Sol), the input before IP (2.5%); (2) nonbound lysate (NB), the input after IP (2.5%); (3) eluate from IP with anti-nephronectin antibody (NN); and (4) eluate from IP with preimmune antibody (pre-I). Western blots of α8 integrin and laminin are shown. Nephronectin coimmunoprecipitates α8 integrin. (E) A schematic showing the α8-enriched lateral protrusions of mesangial cells that contact nephronectin at the GBM. These appear to tether the opposing capillary loop. Scale: 4 μm in (A–C). To determine the role of nephronectin in these α8 integrin–based adhesions, we examined the mutant (Npnt fl/fl; Six2-cre) mice for their presence. Absence of nephronectin, as illustrated in two images (Figure 5, Ca–Cf), led to a loss of the normal structure of the mesangial pedestals. Furthermore, the mutants had more diffuse localization of α8 integrin, with minimal focal enrichment of α8 integrin at areas that laterally flank the base of the capillary loops. Thus, we conclude that nephronectin is required for the formation of these unique GBM-mesangial adhesions. Nephronectin is a known ligand of α8β1 integrin and their binding has been shown in in vitro assays12,13,15,22; however, to definitively demonstrate an interaction in vivo within the kidney, we performed immunoprecipitation with affinity-purified anti-nephronectin antibody on kidney lysates from P0 kidney (Figure 5D). We found that anti-nephronectin was indeed able to coimmunoprecipitate α8 integrin from kidney lysates. It was not possible to replicate these experiments with isolated mature glomeruli because nephronectin from the GBM was highly insoluble. Thus, given their known interaction, colocalization at the adhesion site, and the absence of such adhesions in nephronectin mutant glomeruli, our data are consistent with a model in which nephronectin and α8β1 integrin form a ligand-receptor pair to generate GBM-mesangial adhesions. Given the spot-like appearance of α8 integrin at the GBM-mesangial adhesions, we performed immunofluorescence with paxillin and vinculin, components of focal adhesions. Paxillin partially colocalized with α8 integrin at these GBM-mesangial adhesions (Figure 6A, arrowheads). Vinculin in mesangial cells was medial to and partially colocalized with the α8 spots (Figure 6B). Thus, the GBM-mesangial adhesion may represent a specialized type of focal adhesion. GBM-mesangial adhesions are focal adhesion–like structures. (A) Immunofluorescence with paxillin, α8 integrin, and endomucin (EM, a marker of endothelia) of a capillary loop (CL) and adjoining mesangial cell (M). Paxillin partially colocalizes with α8 integrin at the mesangial pedestal (arrowheads). (B) Immunofluorescence with vinculin, α8 integrin, and endomucin shows that vinculin partially colocalizes with α8 integrin (B, see arrowheads) and is medial to α8 integrin. Scale: 2 μm. Although nephronectin was produced by a subset of renal tubules in addition to podocytes (Figure 1A), tubules from Npnt fl/fl; Six2-cre mice appeared grossly normal by histologic examination (as seen in Figure 2A). To further asses the role of podocyte-derived nephronectin, we generated mice with podocyte-specific deletion of Npnt. These mutant mice (Npnt fl/fl; Podocin-cre) phenocopied the Npnt fl/fl; Six2-cre mice in their mesangial expansion, although the phenotype was milder in its appearance and later in onset (4 months) (Figure 7, A and B). The mesangial sclerosis was quantified in a double-blinded manner as before. Thus, nephronectin specifically derived from podocytes affects mesangial cell behavior. Together, these results provide support for an essential role for nephronectin in podocytes that allows for GBM-mesangial adhesion and regulation of mesangial behavior. Absence of podocyte-derived Npnt leads to mesangial expansion. (A) Periodic acid–Schiff–stained kidney sections of 4-month-old mice. Mesangial expansion is noted in some glomeruli from mutants (Ac and Ad, Npntf/f; Podocin-cre) compared with controls (Aa and Ab, Npntf/f). (Ad) A severely affected glomerulus is shown. (B) Mesangial sclerosis (MS) index in 4-month-old mice. Glomeruli were scored from 0 to 4 (see Concise Methods for details). More than 100 glomeruli were analyzed from each mouse. Analysis was performed in a double-blinded fashion by two independent investigators. Both yielded statistically significant differences between controls and mutants using the unpaired t test (*P<0.01). Ctl, control (Npntf/f); Mut, mutant (Npntf/f; Six2-cre). 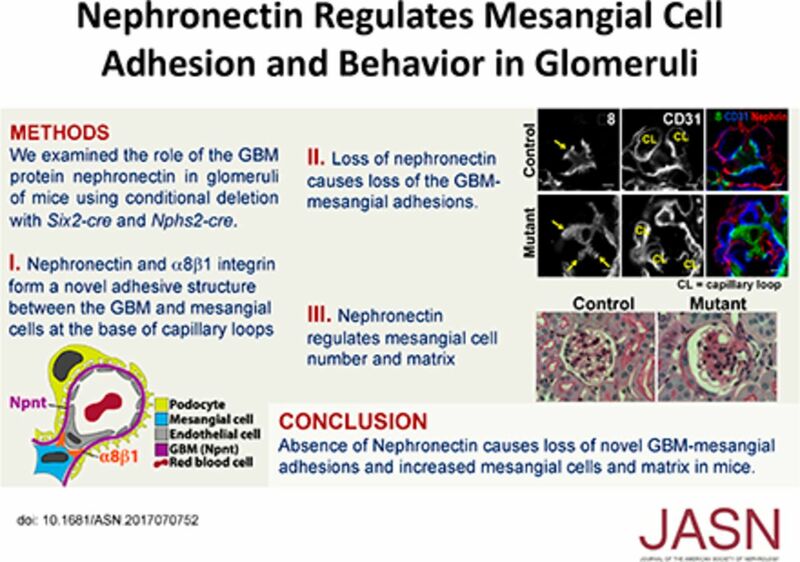 In this work, we examine the role of nephronectin within glomeruli, demonstrating that nephronectin is required to regulate mesangial cell number and matrix deposition. Importantly, we show that nephronectin and its receptor, α8β1 integrin, form a novel GBM-mesangial adhesion prevalent at the lateral bases of capillary loops. Indeed, a beautiful electron microscopy study conducted in the 1980s by Sakai and Kriz10 had previously shown that mesangial cells interact with the GBM at these regions, although the molecular composition of this interaction had been unknown. Our study also shows the nephronectin–α8β1 integrin adhesion is essential for the normal structure of the glomerular tuft. The major receptor for nephronectin is α8β1 integrin,12,15 and interaction of nephronectin and α8β1 integrin has been shown to be essential in two other contexts: initiation of kidney development at the ureteric epithelium and mesenchyme, and formation of a muscle cell niche in hair follicles.22 In the latter case, nephronectin is deposited into the basal lamina by the bulge cells of the hair follicle, where it serves to position and anchor the arrector pili muscles through an α8β1 integrin–mediated adhesion. This example is germane to the GBM-mesangial adhesion observed here, because both may be sites of force generation, although this is a hypothesis that will need to be tested. The most overt histologic findings in the nephronectin mutant mice are the increased mesangial cell number and matrix. How this occurs is yet unclear, and because these features are often present in states of mesangial injury,23 they may reflect a compensatory process. One possibility is that they occur secondary to the loss of GBM-mesangial adhesions, perhaps serving to restore mechanical stability. Interestingly, mice null for Itga8 (α8−/−) also have notable mesangial hypercellularity and increased mesangial matrix deposition, among other defects.24 It should be noted that the interpretation of the mesangial pathology observed in α8−/− mice is hampered by the global defect in renal development of α8−/− mice. Most α8−/− mice have renal agenesis, either bilateral or unilateral, and the kidneys that form are small and dysplastic.16 Because α8β1 integrin is produced by the metanephric mesenchyme, as well as mesangial cells, pericytes, and other vascular smooth muscle cells,16,24,25 it is difficult to ascribe the glomerular defect of α8−/− mice specifically to its role in mesangial cells. However, in vitro studies with mesangial cells lacking α8 integrin strengthen this conclusion, showing the presence of α8 integrin generates intracellular signals that inhibit cellular proliferation specifically when on ECM components that bind α8 integrin.26 Combined with our own results, these data suggest a model in which nephronectin–α8β1 integrin interactions may serve both adhesive and signaling functions to influence mesangial behavior. Nephronectin levels are altered in several human glomerular diseases, including diabetic nephropathy, FSGS, and membranous glomerulonephropathy,27–29 although its role in disease pathogenesis is unknown. We speculate that nephronectin and α8 integrin form part of a larger complex designed to provide mechanical stability to capillary loops. Another possibility, although less likely, is that GBM-mesangial adhesion allows mesangial cells to generate sufficient mechanical force when contracted (e.g., in the setting of physiologic stimuli) to decrease the diameter of capillary loops, and thereby reduce glomerular filtration. Both ideas are speculative and will need to be tested in future studies. Additionally, although our work has mainly focused on the role of nephronectin in mesangial interactions, the absence of nephronectin may also affect other aspects of the cellular crosstalk that exist within glomeruli, either directly or indirectly leading to changes in GBM-podocyte or GBM–endothelial cell adhesion and/or signaling. Indeed, future studies to characterize these interactions and identify in vivo receptors of nephronectin within podocytes and endothelia will advance our understanding of the role of the matrix microenvironment in glomerular function, both in health and disease. We crossed Npnt fl/fl females to Npnt fl/+; Six2-cre19 males to obtain Npnt fl/fl; Six2-cre mutant embryos. Similar crosses were performed with the Podocin-cre (also called the Nphs2-cre) mouse line.30 Mice were maintained on mixed genetic backgrounds consisting largely of C57Bl6 and 129SvJ, with 100% penetrance of the mesangial expansion phenotype. In preliminary experiments, we also deleted Npnt using Pax3-cre18 and Wnt4-cre.19 Mice were genotyped by standard PCR. Procedures were performed according to UTSW IACUC–approved guidelines. Serum and urine Cr were determined by HPLC (UTSW O’Brien Kidney Center Core). Urinary albumin was determined using a direct competitive ELISA (Albuwell M, Exocell Inc.). For paraffin sections, kidneys (6-week, 4-month) were fixed in 4% paraformaldehyde in PBS overnight at 4°C, embedded in paraffin, and sectioned at 3 μm. Antigen retrieval was performed with Trilogy (Cell Marque). Nonparaffin sections were fixed in 4% PFA/PBS, permeabilized with 0.3% Triton X-100/PBS (PBST), and blocked with 10% donkey sera/PBST, as performed previously.31 Sections were incubated with primary antibodies overnight (4°C), then with fluorophore-conjugated secondary antibodies, and mounted with Prolong Gold (Invitrogen). Immunohistochemistry was performed similarly except secondary antibodies were HRP-conjugated and DAB was used for staining. Histologic stains, including periodic acid–Schiff, Jones’ methenamine silver stain, and Masson’s trichrome, were performed by the UTSW Molecular Pathology Core. RNA in situ hybridization was performed on paraffin sections of adult kidney according to standard protocols. A 0.9-kb fragment of mouse Npnt cDNA was subcloned into pSPT-19. Digoxygenin-labeled riboprobes were synthesized from the template linearized with EcoR1 and transcribed with T7 RNA polymerase (antisense probe), and linearized with Xho1 and transcribed with SP6 RNA polymerase (sense control probe). All primary antibodies were used 1:100 unless stated otherwise. We used affinity-purified nephronectin12 and affinity-purified α8 (1:200),32 aquaporin-2 (SBT, sc-9882), podocin (a gift of P. Mundel),33 tamm horsfall protein (1:250; Biogenesis, 8595–0054), PDGFRβ and NG2 (a gift of W. Stallcup),34 CD31 (R&D Systems, AF3628), agrin (R&D Systems, AF550), perlecan (Millipore, MAB1948P), NCAM (DSHB, 5B8; GeneTex, H28–123),35 collagen α4(IV) (a gift of J. Miner),36 laminin (Sigma, 9393), WT1 (Millipore, 05–753), ERG (Abcam, ab92513), vinculin (SBT, sc-7649), paxillin (Abcam, ab32084), lotus tetragonolobus lectin (Vector Laboratories, B1325), and phalloidin 647 (Invitrogen). Secondary antibodies were purchased from Jackson ImmunoResearch, Pennsylvania. To affinity purify anti-nephronectin antibody, we first expressed and purified MBP–C-terminal nephronectin from E. coli. The purified protein was covalently coupled to CNBr Sepharose. Nephronectin antibody-containing sera was added to the coupled resin and washed. The affinity-purified antibody was eluted with glycine and dialyzed against PBS. Quantification of mesangial sclerosis by light microscopy was performed on 3-μm sections using a modified published method.37 Samples were double-blinded. Each glomerulus was assigned a score of 0, 1, 2, 3, or 4 on the basis of an estimated mesangial area of 0%–10%, 11%–25%, 26%–50%, 51%–75%, or >75%, respectively. All glomeruli were scored within sections, and an average score was determined for each mouse. Confocal imaging was performed on a Zeiss LSM510 or LSM880 with Airyscan laser scanning microscope. Light microscopy was performed with a Nikon TE300 inverted fluorescence microscope (AxioCam HRc camera and AxioVision 4.5 software) and a Hamamatzu Nanozoomer. Immunofluorescent images were analyzed using ImageJ software. Images were minimally processed and resampled to 300 dpi using Adobe Photoshop. For determination of endothelial and podocyte cell counts by immunohistochemistry, we analyzed all glomerular tufts within a kidney section for the number of ERG-positive or WT1-positive nuclei, which were brown from DAB, per total hematoxylin-stained nuclei. For mesangial cell quantification, we colabeled sections with α8, ERG, and DAPI. Mesangial cells were counted in glomeruli as the number of ERG-negative nuclei that were surrounded by α8. In general, there was no overlap between α8-positive and ERG-positive cells. To quantify levels of GBM components from immunostained sections, we determined the peak fluorescent intensity from lines drawn perpendicularly through the GBM at various capillary loops located along the rim of glomerular tufts (thus not in mesangial areas) using ImageJ. We normalized these values to the average peak intensity from six similar lines drawn through the basement membranes of adjacent tubules within the same image. All images were taken at the same settings. At least five glomeruli were analyzed from each animal. All data shown are mean±SD. Statistical significance was performed using the unpaired two-tailed t test unless stated in the figure legend. Rabbit nephronectin antibody was covalently coupled to protein G Sepharose according to standard protocols.38 Neonatal kidneys were homogenized in ice-cold HB (50 mM Tris pH 7.5, 150 mM NaCl, 2 mM MgCl2, 0.5 mM PMSF, 2 μg/ml pepstatin A, and a protease inhibitor cocktail), and centrifuged for 30 minutes at 17,000 × g. The supernatant was collected and diluted 1:1 with EB (HB with 2% TX100). It was placed at 4°C for 45 minutes, then centrifuged at 100,000 × g for 50 minutes. The supernatant was collected and incubated with the antibody-coupled Sepharose for 30 minutes at 4°C, washed, and eluted with SDS sample buffer. Each immunoprecipitation used 125 mg of kidney and 10 μl of antibody coupled to Sepharose beads. We thank T. Carroll and A. Rodan for reviewing the manuscript. We thank L. Chen for preliminary results; J. Miner, W. Stallcup, and P. Mundel for antibodies; and J. Linton, L. Reichardt, and A. McMahon for mice. We thank Detlef and Hanno Schlondörff for scientific feedback. This work was supported by Basil O’Connor Starter Scholar No. 5-FY13-201 from the March of Dimes Foundation (D.K.M. ), the Healthcare Coplon Grant (D.K.M. ), National Institutes of Health (NIH) R01DK099478 (D.K.M. ), and NIH P30DK079328 (O’Brien Center Grant). Conceptualization, supervision, and writing of the first draft were performed by D.K.M. All authors performed experiments, generated figures, and reviewed/revised the manuscript. Data analysis was performed by S.E.Z., C.H., J.T., and D.K.M. See related editorial, “Maintenance and Breakdown of Glomerular Tuft Architecture,” on pages 1075–1077. This article contains supplemental material online at http://jasn.asnjournals.org/lookup/suppl/doi:10.1681/ASN.2017070752/-/DCSupplemental.